Spacious Singlewide in Very Nice Family Community!! Low lot rent of $762.00. Financing Available!! 2 Bedrooms and 2 bathrooms. Open living area to kitchen and dining. Includes Refrigerator, Stove, Dishwasher. Washer, Dryer and 2 Window A/C Units. Long 66' Singlewide Home has laminate flooring in the living area. Bedrooms have vinyl flooring. Shingled roof, vinyl lap siding and nice screened porch on a corner lot. Home needs a little TLC. Central air needs to be serviced. 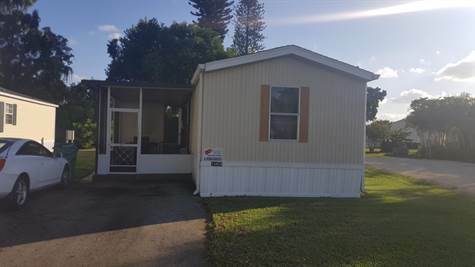 Located in Sunshine Village, a beautiful and affordable manufactured home community located in Davie, Florida. Enjoy recreational facilities right on site. Recreational facilities include a community center fully equipped with activity and assembly rooms for entertaining family and friends, a beautiful swimming pool with sun deck. Playground, shuffleboard and basketball courts available as well as easy access to great schools, stunning beaches, and a wide variety of Davie attractions.